Get started with your whole-home mesh Wi-Fi network with this Synology Wireless Tri-Band Mesh Router Kit from B&H. 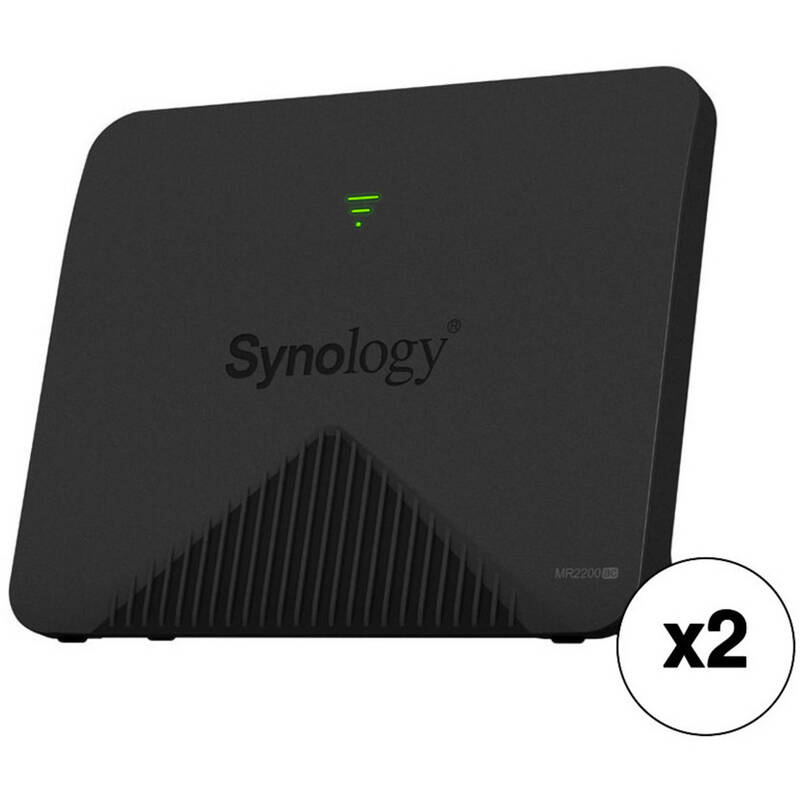 You can link the two Synology Wireless Tri-Band Mesh Routers together under one SSID name for seamless roaming inside your house. With Wi-Fi 5 (802.11ac) connectivity and using one 2.4 GHz (400 Mb/s) and two 5 GHz (867 + 867 Mb/s) bands, the router can reach up to 2.13 Gb/s. All Wi-Fi connections and devices can be managed via the Synology Router Manager (SRM 1.2). Expand your Wi-Fi network to cover your entire home with the Synology Wireless Tri-Band Mesh Router. With Wi-Fi 5 (802.11ac) connectivity and using one 2.4 GHz (400 Mb/s) and two 5 GHz (867 + 867 Mb/s) bands, the router can reach up to 2.13 Gb/s. You can link several MR2200ac mesh routers together under one SSID name for seamless roaming inside your own home. For temporary visitors, you can set up a guest network with limited, timed access to ensure your personal Wi-Fi network remains safe and prevents unauthorized access. All Wi-Fi connections and devices can be managed via the Synology Router Manager (SRM 1.2). You also have access to features such as user profile creation, detailed traffic management, advanced web filters, and whitelisting features. With the integration of third-party databases, such as Google Safe Browsing and DNS/IP threat intelligence, you can enjoy a secure, yet powerful network management experience. Speaking of security, this router supports WPA3-Personal/Enterprise certified encryption. It also has a WPS button for an automatically configured, secure setup. There are two internal antennas as well as a Gigabit Ethernet RJ45 LAN port and a Gigabit Ethernet RJ45 WAN port. Connect an external hard drive or a printer to the router via USB 3.1 Gen 1 Type-A port for either file sharing or wireless printing, respectively. This router supports whole-home mesh networking. Simply extend an existing RT2600ac Wi-Fi network with an additional MR2200ac or integrate multiple MR2200ac mesh routers. The single SSID name you set allows you to roam from room to room without signal dropping. With one 2.4 GHz and two 5 GHz bands available, this router utilizes MU-MIMO technology to enable simultaneous connections from multiple devices, which helps maximum Wi-Fi speeds and reduces congestion. Use Smart Connect to ensure devices are automatically connected to the ideal band for optimal connection performance, reducing delays and interruptions. Use Guest Network to provide a secure connection and give public and temporary visitors limited permissions and access. You can also set up a welcome portal for everyone connecting to your Guest Wi-Fi. You will also have access to tools such as scheduling, auto password change, and MAC address filtering to prevent unauthorized access. There is a dedicated WPS button on the router. Simply press it to allow your Wi-Fi connection to automatically configure and enjoy a hassle-free setup. You can also attach a printer or an external hard drive via the USB 3.1 Gen 1 Type-A port for wireless access and file sharing. Synology Router Manager (SRM) provides tools so you can quickly set up, customize, and efficiently troubleshoot issues. Box Dimensions (LxWxH) 10.75 x 9.25 x 3.1"
Wireless Tri-Band Mesh Router Kit (2-Pack) is rated 5.0 out of 5 by 1.